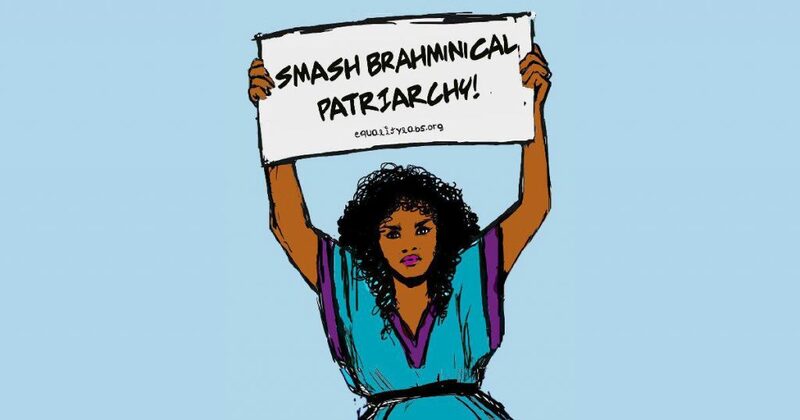 With the recent surge of sheer “ignorance” about what is Brahmanical patriarchy and treating it as a concept that never existed before the discussion that took off on Twitter, it is perhaps important to see where exactly does this ignorance configure in a casteist system. Jaahil, ganwar, dehaati: these were three words that I often heard in my Brahmin upbringing whenever my lower-caste grandmother’s family was referred to. They were used to not only remind everyone that my grandmother is indeed from a shudhra family, lucky enough to be married to my Iyer grandfather, but also to refer to my grandmother’s own ignorant ways of being and living as a consequence of her caste. Her ignorance was deemed as not only the result of but symptomatic of her caste—a defining characteristic to be lower caste is to be lowly, ignorant and not know the best ways of life. Ignorance and caste was taught to me as simultaneous: if you find someone ignorant, ask them their caste—they are probably not Brahmins. Ignorance thus, has always been a primary way of perpetuating a casteist system and reinforcing it through various modalities of unknowing. Knowledge and power has always been thought to inform each other, like it did in my Brahmanical household: to be a Brahmin is to be the knower- to be knowledgeable and learned was the job of the Brahmin and hence the stakeholder of knowledge resources was a Brahmin (and a Brahmin male). However, with the preoccupation of understanding power relations with knowledge, we have often not considered the ways in which ignorance produces and reinforces power. Ignorance has recently been studied as socially produced, managed, cultivated and systematically perpetuated as a state of being. What theorists like Proctor and Schiebinger shown us is that ignorance can also be “deliberately engineered” to perpetrate dominant regimes of knowledge. Epistemologies of ignorance and racial privilege have thus been studied in order to understand this oft ignored connection between wielding power through systematic ignorance. To understand ignorance in this way is to see it as processual—as constantly being produced and pervasive. Caste too, needs to be read through the forms of ignorance that reinforce its hold on the society. Caste is not determined by the colour of one’s skin or any unsubtle physical aspect of the body; it does get written on the body but not through it. Physicality is attached to caste as an afterthought as it is not intrinsic to caste to be physically visibilized in order to function: it often forms the various ways in which caste gets justified although it is not the criteria through which it gets created. This is not to say caste is much more complex than race wherein epidermal visibility, or as Fanon would put it: epidermalization of inferiority plays a part; it is to state that caste is always in the state of unknowing: you won’t know a person’s caste until you know their surname, their occupation, their identification in the reservation system while on the admission list in a college. In other words, caste isn’t known naturally but asks for active knowing. In this inquiry lies its most entrenched discrimination. In this structure of active knowing, ignorance takes different forms in the caste system. First of the most frequent kind is seen in those sectors which commend merit over social categories as their system of differentiation. Gopal Guru in his essay on the corporate sector talks of this “veil of ignorance” which in fact reproduces caste system that it claims to have no engagement with. By focusing on merit as the ultimate deciding factor for recruitment and promotions, corporate sector also creates the category of demerit. This demerit is what Gopal Guru argues, “is the result of a historical disadvantage and exclusion of dalits from the opportunity structures.” Merit is also a product and not an intrinsic value that is tapped onto, and this active ignorance towards caste doesn’t translate to eradicating the prejudices of the caste system, or rising above it: it functions well within and through its core. Second kind could be to not know until one knows, which may sound like any progress from ignorance to knowledge. However, within the precincts of caste system this linear progression towards knowing someone’s caste from the state of unknowing is where the systematic play of discrimination becomes clear. To know someone belongs to the untouchable caste is to not always already know they are untouchable: caste needs to be spelled out first in order to know the status of untouchability. Historically, this has been determined through someone’s occupation wherein those regarded as untouchables did menial jobs for the upper caste. Cleaning after the upper caste has always been the occupation of those who are seen as unclean and impure, and ignoring their caste is dangerous as it means to clean up for oneself. In other words, caste is asked when assigning certain kinds of work deemed as appropriate for that particular caste, lest one has to do menial jobs by themselves. Caste system requires this inquiry: it may not always be a direct question but also works through presumption, yet it indicates how caste functions not on visual perception but on mental cognition: it has to be asked for, inquired into, categorised and systematically produced. Hence, in this manner, caste is always unknown until it is made known. Ignorance about your caste thus isn’t lack of knowledge but indeed, knowledge of its own kind. Not knowing one’s caste is perhaps because structures of life have not compelled one to know it: one’s life is built around privileges of being generic and indeed, general. Caste does not jumpstart when being general turns into the (reservation category of) General: one needn’t enter actively into the reservation system to function in a caste system. To be generic/General is to have the privilege of leading one’s life having to not know their social standing. Unknowing here is the privilege of not having to know one’s status as upper caste: it is the lower castes who need to be reminded, and these reminders translate into a natural sedimentation of the position and privilege of upper caste persons. Knowledge of one’s caste is not always a powerful phenomenon: indeed, knowing one’s caste is the first step to knowing which opportunities will remain inaccessible throughout life. Your “honesty” is already winning accolades because to be caste-aware is apparently to say “Oh I didn’t know”, without seeing that your ignorance is what killed our foremothers, and made us slave in your house while you fiddled with your playstation. To have the power of engaging in an act without knowing its casteist origin or implication, to be ignorant of the casteism in everyday acts shows how casual ignorance can be the most dangerous form of casteism. To not know one’s casteism is to practice it vehemently: ignorance here is thus not lack of knowledge but a tool through which caste needn’t have visible acts of horror committed to be reproduced. Caste thus functions through unknowing and its various indices: it is reminded to those who can only go about their life if they know their caste. This helps those at the higher echelons to function without having to know their own caste on a daily basis. Unknowing in its present continuous form is how caste manifests itself: it is contiguous, continuous and is a processual tussle between those who have to know and those who need not. In reminding my grandmother her caste through her assumed and reinforced characteristic of ignorance was to produce the power of my structural ignorance: to not know her lack of knowledge of the best ways of life is indeed produced by those who control the access to knowledge. To name her as always already ignorant was to produce the privilege of my Brahmin grandfather and parents who could do the constant calling, the naming without having to be called and named. All words in Hindustani, meaning ignorant, country bumpkin, unsophisticated etc. Robert Proctor and Londa Schiebinger, “A Missing Term to Describe the Cultural Production of Ignorance (and Its Study),” in Agnotology: The Making and Unmaking of Ignorance (Stanford, CA: Stanford University Press, 2008), 03. Frantz Fanon, Black Skin, White Masks, trans. Charles Lam. Markmann (New York: Grove Weidenfeld, 1967). Katyal IWP 2016 Page 1 of 16,” Docplayer, accessed October 13, 2018, http://docplayer.net/44025351-Katyal-iwp-2016-page-1-of-16.html. The word “Bhangi” is often used as a pejorative term to denote lower-caste persons who are often employed in menial jobs like that of manual scavenging. The jazz-band came under fire for using the name for their title. Prerna S is a PhD student of gender and media in Queen’s University, Kingston, Canada. She studies bodies, spaces and iterations of the same on and off screen.